Getting up early, at Stupid O'Clock, gives you the opportunity to stretch out and not have to rush. Before the world wakes up, the city is at your feet. Literally and figuratively I can go out and walk through the central business district here and see nobody from time to time. It isn't quite a post-apocalyptic scene, there are always a few feathered creatures around to honk at me or an air conditioning compressor humming in the background, but it can be pretty quiet. Even in February, those A/C units can be running, this is South Florida after all. There are wrinkles to that solitude. Plans do change. About a month ago we had a real "gully washer" of a storm. Now for someone in the placid Northeast where they don't get hurricanes, but now they really do, that would be a thunderstorm. Now multiply that by another order of magnitude and that was what we had. In the middle of that my neighbor learned the value of cleaning downspouts when the roof to the Lanai collapsed. It wasn't a pretty sight, but we did get to see what shortcuts were done to that roof. Roofers in Florida. There are honest one. Then there are all the others. At least that is the reputation here. This is how you find out whether you got the honest one. In a thunderstorm, microburst, or "weak" tornado, your roof will remain intact. Or your Lanai roof could fold up and end in your pool and you could be staring through the gloom at your roof joists and be told by an inspector that "When you had it done, it was done wrong". In this case that was about 10 years ago and four owners ago and now we have construction on the block again because that was probably "fixed" in the "Post Wilma" days. At least my new one looks good! I watched them build that thing, you could park a Jeep on that roof. You could but you would break the tiles, so don't. But for my neighbor, not so good. He's patching it back up with the help of a swarm of white trucks that have the word "ROOFER" screaming on the sides. It all starts around 8 AM. About three hours after I got up this morning by my hazy count. My fearful Mr Dog, Rack, doesn't like that noise. Which is to say that trees are normally green, and water is normally wet. Day number "zero", we had the microburst/T-Storm that moved people's furniture into the next yard, knocked over a tree into a car, and did all sorts of mischief. Day number one, he hid. Day number two, he hid more effectively. We're in Day Number Three. I have begun closing off hiding spaces. On Day number two he hid so effectively that he was missing from start to plus two hours after they finished. I know I have a dog in the house because every so often there is a muted jingle from the dog tags or the boxes stuffed behind the recliners in the living room move. Why are there boxes behind the living room recliners? So the dog doesn't go back there and hide and end up with legs under the chair. If you visit, look behind the recliners. That's where the boxes hide. I really should just embrace that and put spare things back there like hurricane supplies since the dog has learned not to bother with them, but I am not that well thought out. After all, we just got this year's hurricane supplies last night at the warehouse club. Mac and Cheese anyone? Just stop by in December! Knowing that things will start at around 8AM means I have to prepare. Dog walk is early, and the bowl was filled before we left. He was dancing from foot to foot and doing that high weak reedy whine that dogs will do when they want out NOW! so getting him walked was a priority. When we got back, if he didn't eat quickly, I would have to dose the food with dog biscuits or yogurt to make sure the fussy eater finished before the construction began. Then let him back out in the yard. He will sniff and water the coleus before things get going. I settle in and make coffee and breakfast before it gets too late. 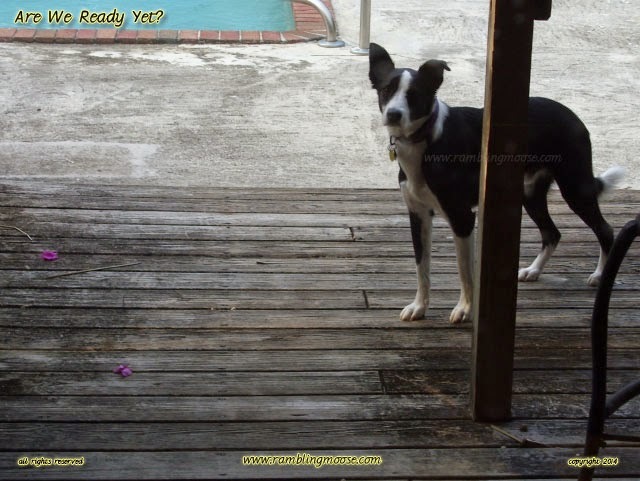 The dog will chase the morning opossum or raccoon out of the yard by simply being there. The neighbor's cat knows not to be here either. Rack will do a perimeter search watering his way around the ruellia and podocarpus, then end up back on the deck. This is when he stares at me. Through the window. He knows. I am cheating on him. Yes, I do, and I am getting attitude from a dog. Just as I get to the door, I hear the ladders arrive from the top of their trucks. Rack sniffs the yogurt, eats all of the white goo, leaves three strawberry chunks in the bowl and finds the corner. It will be a quiet day. Just the growling from the air tools and workers. I may as well turn the music up on the radio, it will be a long one as well.